Results: A new online separation strategy to enrich low-abundance proteins from mouse plasma has improved proteome coverage and enhanced detection of the proteins by liquid chromatography-tandem mass spectrometry. 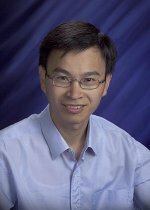 This strategy, designed at Pacific Northwest National Laboratory, is anticipated to have broad applications for biomarker discovery using mouse models. Why it Matters: Most studies to discover disease biomarkers have focused on analyzing blood plasma or serum, the primary specimens to diagnose disease and monitor therapeutics. Despite technology advances, the dynamic range of plasma protein concentrations, which spans more than 10 orders of magnitude, is still a significant challenge for analytical detection technologies such as mass spectrometry (MS)-based proteomics. To achieve in-depth coverage of the plasma proteome, many techniques have been developed to separate low-abundance proteins from plasma and enhance their detection by MS. One of the most effective and reliable is immunoaffinity chromatography using mixed antibodies for selected abundant proteins. This powerful technique selectively isolates and concentrates minor components of interest from complex mixtures using an immobilized antibody on a solid phase support. While this technique has provided promising results, detection of low-abundance plasma proteins is still limited by the number of proteins that the immunoaffinity columns can effectively capture. Online IgY7-SuperMix separation for mouse plasma. Four different fractions, IgY7 bound, IgY7 FT, SuperMix bound, and SuperMix flow through (FT) corresponding to high- to low-abundance fractions were collected and separated on a 4-12% SDS-PAGE. The low-abundance plasma proteins were enriched in the SuperMix flow-through fraction. Methods: To facilitate more effective biological and biomarker discovery studies using mouse models, PNNL researchers designed the mouse-specific IgY7-SuperMix immunoaffinity separation strategy that enhances the detection of low-abundance proteins within plasma. This is based on a similar strategy developed previously for analyzing human plasma samples (see "Improved Protein Separations System Developed by PNNL and Biotech Firm"). 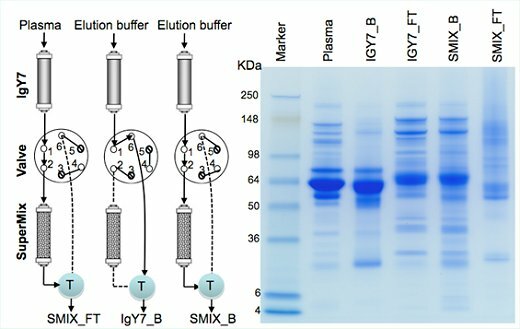 By applying mouse-specific IgY7 and SuperMix columns on-line in tandem, the SuperMix column can effectively capture more than 100 moderate-abundance plasma proteins in addition to the seven most abundant proteins captured by the IgY7 column. Moreover, the results from LC-MS/MS analyses of the SuperMix column flow-through sample reveal a more than 100% increase in proteome coverage compared to the results from IgY7 flow-through samples. These results illustrate the potential for enhanced detection of low-abundance proteins and improved coverage of signaling pathways, as well as the reproducibility of the separation systems for identifying differential protein abundances. 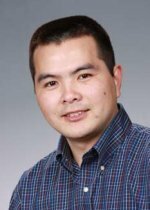 Experimental work was performed in EMSL, the Environmental Molecular Sciences Laboratory, a Department of Energy Office of Biological and Environmental Research national scientific user facility on the PNNL campus. The research team included Jianying Zhou, Wei-Jun Qian, Angela Norbeck, Karl Weitz, Ronald Moore, David Camp, and Richard Smith, all PNNL; former PNNL scientists Brianne Petritis and Konstantinos Petritis, and Rohit Kulkarni, Harvard Medical School. Mouse models are commonly used in studies of human biology and biomarker discovery. Because mice can be bred from a single pair of parents and exposed to the same food and environment, they have significantly less genetic, biological, and environmental variability compared to humans. Mice also share more than 99% of their genome with humans and recapitulate the features of many human diseases, such as diabetes, cancer, and neurological disorders. The availability of mouse samples at early disease stages even makes it possible to find biomarkers for early diagnosis. Biomarker discovery efforts using mouse plasma and proteomics tools have helped identify proteins potentially associated with different human diseases, such as pancreatic tumors, breast cancer, intestinal tumors, obesity and diabetes, and sepsis. However, success remains limited by the inability to detect low-abundance proteins in mouse plasma because of dynamic range and complexity issues similar to those in human plasma.